Did you know your carpets should be meticulously deep cleaned once every one to two years? If you want a truly clean home, your carpeting needs to be refreshed, with the underlying dirt and debris removed on an annual (or semi-annual) basis. Get ‘em cleaned once every 18 months, ideally. Most people hire professional carpet cleaners like the experts from Horizon Carpet. But others choose the DIY (do-it-yourself) route. Which is better? Professional carpet cleaning services have (and use) heavy-duty tools that the average person doesn’t own or even have access to– and these portable steam cleaning machines, or units attached to a truck, have more power to clean than any DIY approach could ever hope to achieve. Sure, you could save money by cleaning a carpet yourself, but is it really worth your time, money, sweat and effort? Most DIYers end up renting a steam cleaner to do the job. These cost, on average, $50 a day. Here’s the problem, though: you might not have any idea on how to properly use a carpet cleaner, which leads to oversaturation of your carpet, equipment complications and frustrations, and, in the end, not being able to easily get to small spaces with the awkward equipment you rented. 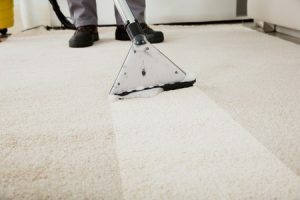 Frankly, if you want a thorough cleaning and you can afford it, hiring a professional carpet cleaner is the way to go. Not only will your carpets receive a deep, powerful cleaning, but also look, smell, and feel refreshed. In Phoenix, if you’ve got dirty carpets, whether at home or the office, you should hire Horizon Carpet to come clean them. Horizon gets rid of dirt, soil, grease, pet hairs, ugly spills, and more. Happy customers often remark their carpeting looks “like new” after Horizon has been to their house or office in Phoenix and its surrounding suburbs. To make your appointment, please call Horizon Carpet at 602-404-8064 (Phoenix and East Valley) or 623-561-6277 (Phoenix and West Valley). With 30+ years of experience, Horizon Carpet’s experience at cleaning carpets means you don’t have to stress out doing it yourself; we’re a trusted, efficient company ready to make your carpets look good as new.